Garruk Wildspeaker is not the man he once was. Cursed by Liliana Vess and the sinister power of the Chain Veil, he turned his savage instincts toward hunting the most dangerous prey of all: other Planeswalkers. Left unchecked, he would have slaughtered his way through the multitude of planes. But—SPOILERS—following the events of Magic 2015—Duels of the Planeswalkers, Garruk's situation has changed. 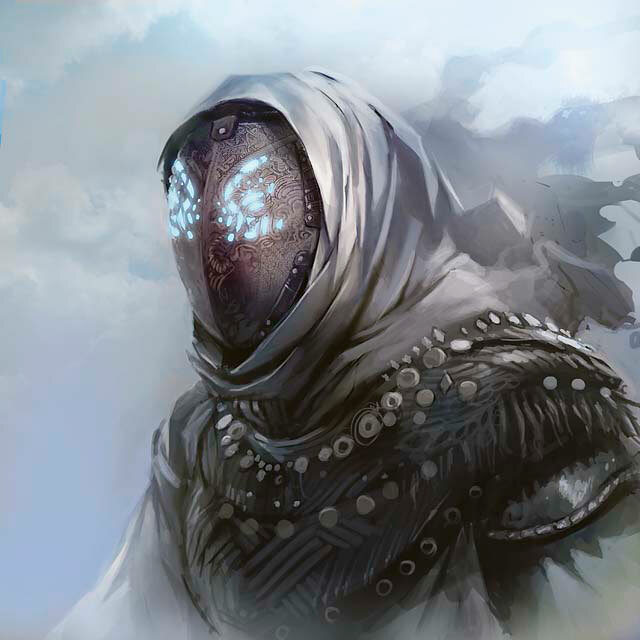 Implanted with a hedron from Zendikar, he finds that the curse's hold over him has lessened, although certainly not lifted. Now he faces a question that could determine his fate: Is Garruk Wildspeaker a monster? He preferred hunting his prey. Moving, chasing, anticipating, watching the quarry's fear reduce it to the instinctive rituals life follows as death chases. So many different forms of life, all with different weapons and defenses and styles and knowledge; but faced with the hunt, they all act the same—the breathlessness and instinctive turns, the widening eyes and the last surge of speed, the final stages of being prey. To be hunted was to die. To hunt was to live. He hated waiting. He had been still in the underbrush for several hours. His right leg had cramped hard off and on for twenty minutes. He had not screamed. The pain was intense, but manageable in comparison to the other recent pain his body had been through. But then, being stabbed with daggers through the throat seemed manageable compared to the pain he had been through. Although he couldn't see it, he could feel the hedron lodged in his flesh, softly pulsing like a second heart. His chance at a second life, of a sort. The hedron was cold, and alien. Many years ago he would have been driven mad by this intrusion of magic and artifice directly into his body. There was no escaping its presence. Its pulsing. The hedron thrummed, although to a tune and tempo that only he could hear. He would live with it, though. His body and his mind were his own again. That freedom was worth any price. He had waited for his prey for a long time. It was his third day back on Shandalar, hoping to get a glimpse. When he last left Shandalar, he thought he would never return. But there he was, just weeks later. A new hunt, a new quarry. "Garruk." It was a whisper of a breeze. A soft, low, female voice. One he had once searched for. "Garruk." The whisper came from behind him. Garruk rose slowly. There was no need for haste anymore. He had been found. He turned, and a small pinpoint of white light dancing in the forest clearing ahead slowly weaved in figure eights. As Garruk approached, the light it flitted away, deeper into the forest. Ahead of an open clearing, mists coalesced into murky pools among a thin copse of trees. The dot of light vanished into the mist. Garruk could not discern any details behind the shimmering opaque gauze. Most of Garruk's senses had been altered during the curse, mostly for the worse. With the hedron holding the curse in check, there was no further damage done, but neither had there been healing. Yet more insults and injuries. A figure strode out of the mists into the clearing. Long, raven-black hair framed a beautiful face. 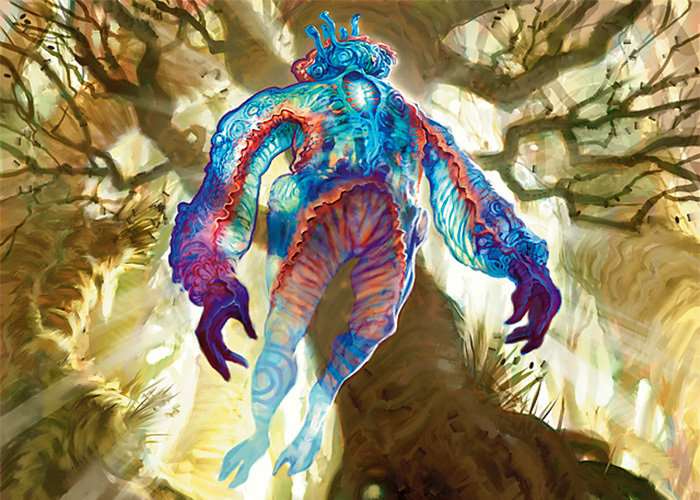 There were light etchings on her face and arms, thin runic lines, but in the dim forest light they were invisible, although Garruk knew they were there. Her normally light violet eyes were obscured by a soft purplish glow. Most would describe the smile on her face as alluring, but Garruk knew the cold cruelty that drove it. Her dress and leggings were exactly the same as the last time they met, when Garruk tried his best to kill her. He had failed. He loosened his axe from the sheath on his back and drew it. The haft rested gently in his hands. The axe had been a dear friend in ending the lives of many Planeswalkers when Garruk was in the full throes of the curse. It just hadn't ended the life of the Planeswalker who had cursed him. Not yet, anyway. "Liliana Vess." His voice was a full throaty rumble that carried across the clearing. Her smile became an open smirk. "Garruk. You're looking remarkably better than the last time we met. I've always found killing to be an effective way of staying healthy. You must be very healthy." Her voice was dulcet lashes of satin. Her bared shoulders slightly tipped and swayed as she spoke. Garruk wondered who between the two of them had killed more. He grudgingly acknowledged he might not win that contest. He continued to stand at the edge of the clearing, holding his axe steady. "No primal roar? No swinging your axe trying to split my head open? Why Garruk, I almost wouldn't be embarrassed to have you over to a dinner party. Find a way to remove your smell and that hedron sticking out of you and you might even be presentable as my arm candy." Garruk said nothing. He re-slung his axe in it its sheath and walked slowly over to Liliana. She raised her arms, and the same purple glow suffusing her eyes illuminated her hands. The last time Garruk had seen that glow from Liliana's hands, it had meant a great deal of pain for him. He continued his slow stride toward her. "How close to killing me were you last time? You had your hands on my throat, choking the life from me, your stinking breath threatening to be my last sensation. Underneath your rage, I could feel your excitement, your desire to kill. It's glorious, isn't it, to see the life flee from those who have hurt you, those who have wronged you? How would people ever know there were consequences, unless people like you and me existed?" 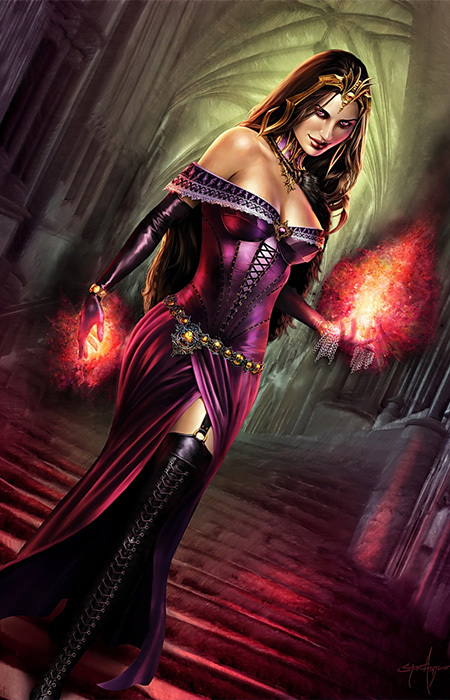 Liliana continued, with the purple glow of her raised hands intensifying. But no magic erupted. No dark tendrils to grip Garruk nor ghouls rising from the ground to slow his path. Garruk contemplated letting this farce drag out further, but he had to get back to hunting his prey. "The looks are perfect, and you have her voice right. But the smells are all wrong, Beleren." Garruk stopped a few feet from where Liliana stood. Her form shimmered and dissolved, and a much different and uglier form replaced her. The figure barely came up to the middle of Garruk's chest, a scrawny, slight man, dressed in a blue cloak and clothing. His hood was up, obscuring his face, but Garruk knew what he would see if the hood was down. When last Garruk saw Jace Beleren, Garruk had his hands around the smaller man's throat, trying to kill him. Garruk recognized a pattern, and he smiled. Liliana may have been an illusion, but she was right. He did enjoy killing. Jace looked up from under his hood. "You've killed a lot of people, Garruk. I have to make sure that's not going to happen again." "I couldn't have killed them if you hadn't sent them to find me in the first place. Stop trying to find me, and people won't die." Garruk felt the weight of the axe on his back, and he knew how much time he needed to draw it and swing. But at that distance, he didn't need the axe. "We can help you. The hedron has bought us time. Come back with me to Ravnica. I've already convened some of our best healers..."
"Who is this we? Where were you when my body was wracked with pain, when my summons decayed in front of me, when voices sought to claim my body and mind?" His voice ended in a shout. His hands clenched into fists before relaxing and then clenching again. "Garruk, you need to come with me. We need to make sure that you're healed, that you won't kill again." Jace's voice was calm, even, confident, as though perfectly designed to send Garruk into a rage. "And if I do want to kill again? Maybe right now?" "Then I'll stop you. Garruk, this is not you. The hedron only keeps the curse in check, it hasn't healed you. Come with me." Jace held out a hand. Garruk took it. "You're not taking me anywhere." Garruk pulled Jace toward him and head-butted him. Jace exploded into glass, shards flying everywhere, and Garruk could feel blood dripping from his face where the glass had cut him. Illusions could kill. But so could he. He roared in the clearing as he unslung his axe. Figures of Jace sprung up all around him, each form a perfect copy, hands up in a defensive posture. "I don't want to hurt you, Garruk." "Lucky for me, I don't feel the same way." "Garruk, this is not a fair fight. You've suffered enough. Please. Come with me." Garruk swung his axe through the illusions. Each one shattered like glass. The air around Garruk solidified into an icy goo, his movements slowed, his breathing labored. "These illusions are good, Beleren. But to be this good..." Garruk's arm lashed out to the side and found what should have been an invisible form. "...you have to be really close." Garruk's hand closed around Jace's neck. For the first time ever, Garruk saw a look of surprise on Jace Beleren's face. He didn't beg. Garruk respected that. "First, you spend too much time inside minds. Pay closer attention to the real world, Jace. 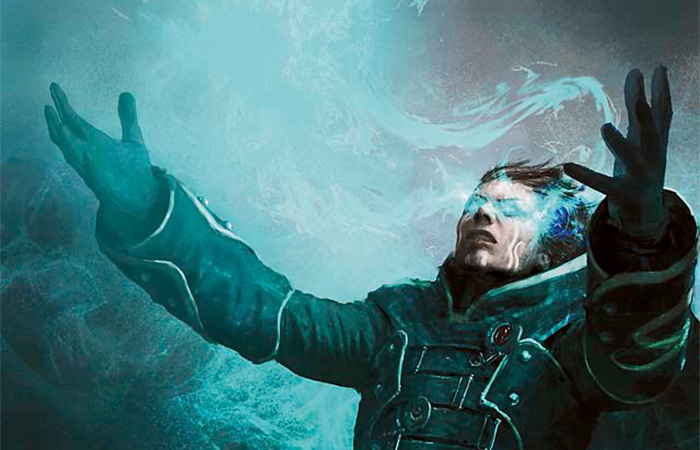 Second..."
Garruk saw a shimmer in front of him, and a ghost image of Jace was superimposed over the real one. The image of Jace widened ever so slightly, and Garruk's hands automatically loosened to fit. This repeated until the real Jace had enough room to slowly ease his neck out of Garruk's grip. Garruk tightened the grip hard. "How are you...? You shouldn't be able to..." Jace's words ended as he struggled to breathe. "Second, you rely too much on illusions. Learn to fight, little man!" Jace's face turned purple. Garruk loosened his grip slightly. Jace took in a big gulp of air, and let out a single word: "Monster." The first time Garruk had heard that word from Jace during their first encounter, it had been like a blow. Garruk laughed. "You're right, I am a monster. Third, and this one is important: if you come after me again, or send someone, you will die. Do you doubt me?" Jace shook his head. He still didn't look afraid. At least the mind mage wasn't all jelly. "I can't..." Jace's voice was raspy, and he struggled to regain his breath. "I can't leave you as a homicidal maniac. I have to..."
"Go ahead and read me, Beleren. I'm not that complicated." Garruk could feel the foreign touch in his mind, and despite all he had done to set up the encounter, he almost ended Jace's life there. He would kill every single person he could if it would keep him free. Jace's touch receded. There was a look of disgust on his face, but also a look of surprise, and Garruk thought he saw some acceptance as well. "You...you're clean. How is that possible?" "Because I am what I am. I'll kill if I have to. I may even," and there Garruk opened his mouth in a wide smile, "enjoy it from time to time. But if you and the others leave me alone, then you have nothing to worry about. That's the best deal I'm going to offer." Jace stood in thought. Garruk held him by the throat, could end his life in an eye blink, had already proven he was immune to Jace's illusions. Garruk laughed again. If Garruk was open to having friends, then Jace might have been a good one. "You win," said Jace. "We will leave you alone. I will not seek you out. But please, if you change your mind, come find us on Ravnica. Something is still not right here. We can help you." Garruk let go. Jace rubbed his neck, and Garruk could see the deep purple bruises he had left. He continued to smile. "One final piece of advice, Beleren. Only the very best hunters can hunt alone. You? You need friends." Jace looked at him, and a picture of a library in Ravnica shimmered behind him. 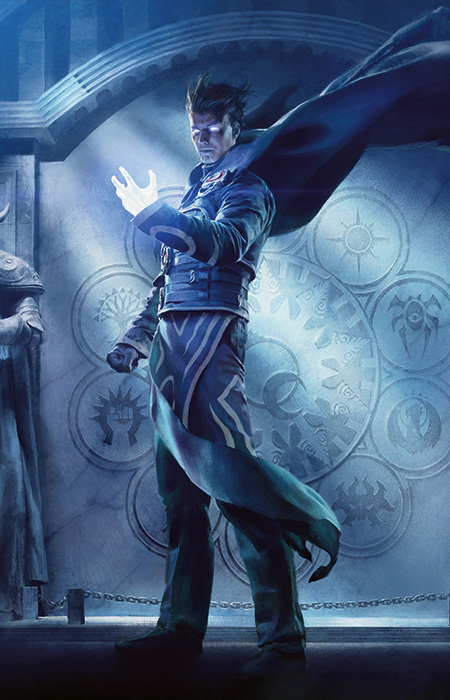 Images of Jace began stepping backwards into the library, image after image after image, each superimposing on top of one another in the library, and only the barest whisper of an image remained on Shandalar. 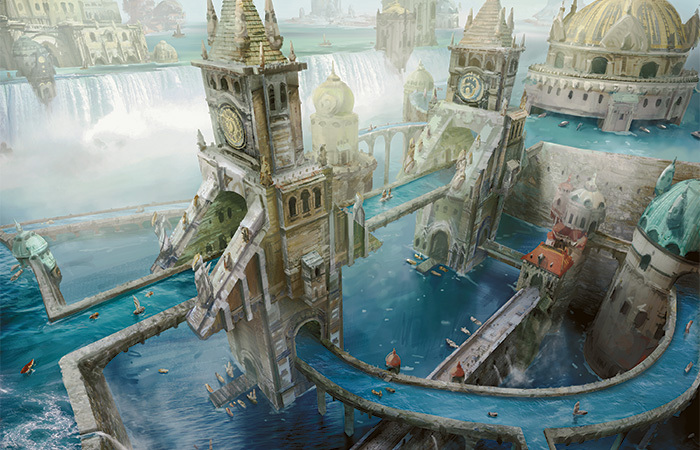 And then Jace, and the vista into Ravnica, was gone. Garruk breathed deeply, and momentarily slumped on his axe. He hurt. He had to project strength to Jace, but he was still weak. The hedron continued to beat, to thrum. He hadn't been sure his plan was going to work. It was strange for a hunt to end successfully without a kill or a trophy, but that had been life for Garruk recently. Strange. He decided to rest a little before leaving Shandalar for his next destination. A short time later, a man approached him from the other side of the clearing, striding confidently toward Garruk. The air in the clearing became cold, and the man's footsteps crunched loudly on frozen forest floor. 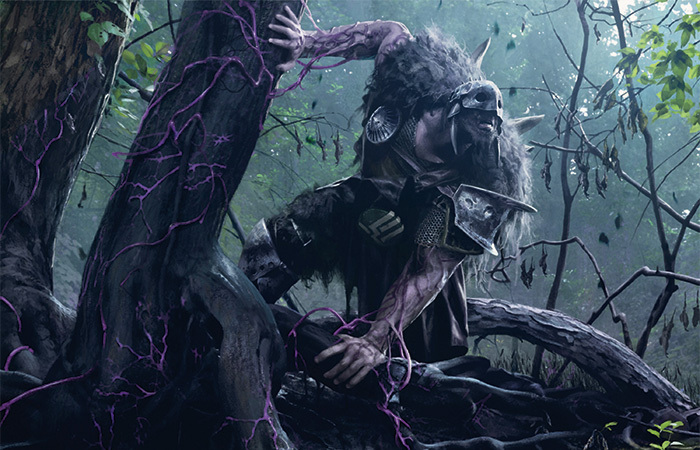 Even with diminished senses, Garruk realized he should have been able to smell the man coming, but the man had no smell. He was tall and thin, dressed in blue robes tinged with silver and black. His face was long and pale, and his white hair was rimmed with frost and icicles, making it stand out like long, white spikes. His eyes were a deep blue, with no visible iris. Garruk took up his axe with both hands. "Odd." He was mostly sure he wasn't hallucinating again, he didn't feel the active blight in his veins the way he had back on Innistrad, but he couldn't be too sure. "Who are you?" "I am here to take you back to Innistrad. Come with me now, Garruk." His voice was clipped and harsh. A grating tone. "Didn't I kill all of you already?" "Vronos paid me a great deal of money. You will come back with me now. You can come on your own, or you can come in an ice block." Many things about the situation annoyed Garruk. He wanted to rest. He was tired of people searching him out. Garruk didn't like the cold. And the man ignored his question. Garruk needed to call the man something. He decided on Icy. "You see what happened to Vronos." Garruk pointed to the mask still on his belt. "I saw. I saw what happened to all of them. I needed more time to prepare. When I was ready, I came to get you. Then I saw you and Jace Beleren." There was a note of uncertainty in the harsh voice. "Right, Jace Beleren. Who organized this whole hunt in the first place. A lot of people are dead because of Jace Beleren. Are you volunteering to be among them?" "Yes, a lot of money. So you have your money, right? And you saw that I let Jace live. Because he left me alone. Jace is not going to come get the money back. And Vronos certainly is not going to come and get the money back. Leave me alone, and you get to enjoy it." Garruk could feel the hesitation, the calculation in Icy's head. "Very well. But...a question. Jace Beleren has a great reputation as a master mind mage. Yet you seemed to know where he was hiding. How?" "It's the food I eat. Very natural. Healthy. Makes me good at resisting mental alteration." "You are lying to me. You should not lie to me. It could become unpleasant for you." The cold intensified. Ice crackled in the air. "You think a little cold would stop me?" Garruk smiled. The blue orbs blinked for a moment. The air between the two of them thickened and developed an icy sheen. "Take a step toward me, beast, and I will freeze the air in your brain and shatter it. We will see how good you are at resisting alteration then." Garruk grunted in acknowledgment. "That does sound unpleasant. It was a joke. I don't know why Jace's illusions didn't work. Maybe he's just not that good at them." Garruk shrugged. Icy took a step backward, and the air froze heavily around him as globules of ice formed suspended in the space behind him. The globules reflected a different place than the one they were in—a white, icy landscape covered in drifting snow. The globules of ice grew and circled around Icy. Garruk held up a hand. "A question. How long does it take you to planeswalk?" Icy's eyes widened, and his mouth opened as his hands raised up. Garruk gripped his axe, pivoted, and took Icy's head off at the neck, just as the globules had begun forming into a single icy portal. Instead, the globules shattered, and immediately melted into water at Garruk's feet. Icy's body slumped lifeless to the ground, his head rolling to the side, its blue orbs gray and still. "Too long, it looks like." Garruk laughed again. He no longer needed to kill. And he certainly didn't need to kill Icy. But Icy had asked to die when he threatened Garruk. Had Icy lived, he would have realized a valuable lesson: Don't threaten monsters. Garruk planeswalked to his next destination.